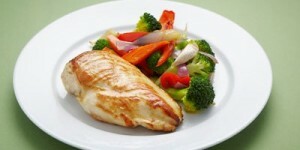 Place chicken breast in a baking tray with all vegetables except broccoli. Drizzle with olive oil, sea salt and pepper and place in a 170 degree oven. Allow to cook for 20 minutes but turn chicken over half way through. Place broccoli in a pot of simmering water and cook for 2 minutes then strain. Put chicken, roasted vegetables and finally broccoli on your plate and relish the vibrancy of the colours. The roasted garlic can easily be squeezed out of its skin and will be very sweet after roasting.